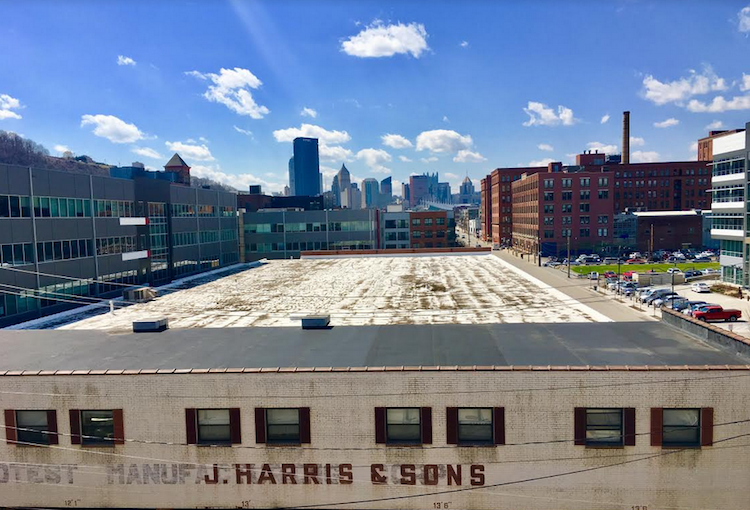 Like many of Pittsburgh’s postindustrial neighborhoods, the Strip District struggled to attract investment for decades after the collapse of the local shipping and manufacturing industries. Today, with several hundred new apartments underway, companies like Facebook, Apple and Uber jockeying for office space and Smallman Street earning the nickname “Robotics Row,” it’s safe to say that attracting new business is no longer the issue. On April 10, Oxford Development announced an expansion of their Stacks at 3 Crossings project, which will add 11 acres of mixed-use space to the existing offices along Railroad and Smallman streets. 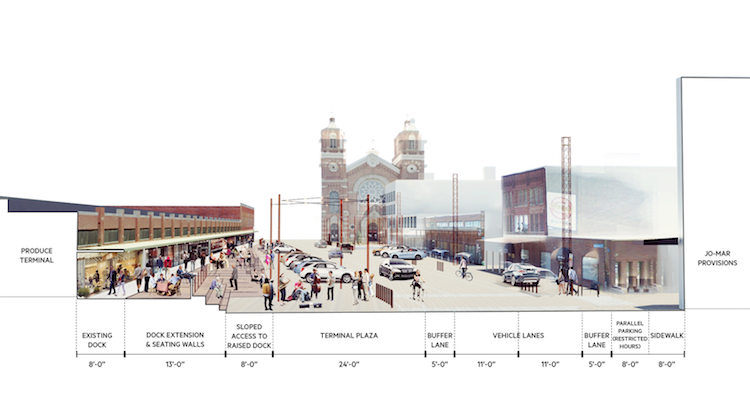 The project will now include approximately 600,000 square feet of office space in six buildings, 300 residential units in two buildings, 50,000 square feet of retail and a multimodal transportation facility on Smallman and Railroad between 28th and 29th streets. Smith & Nephew, an international medical robotics company, has already signed on as the first tenant. 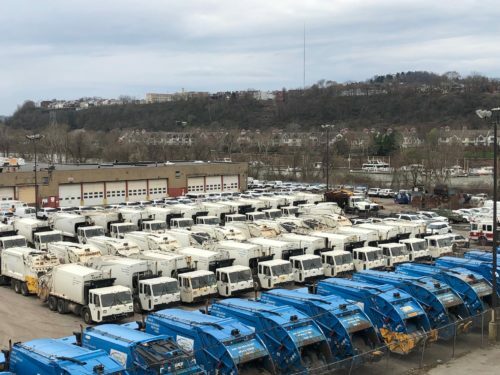 While many community leaders have celebrated this notable turnaround in the Strip District, several tell NEXTpittsburgh that the new prosperity has produced its own set of challenges. According to data from the Urban Development Authority (URA), the population of the neighborhood has increased from 492 in 2010 to 688 in 2018, with 1,055 projected by 2023. 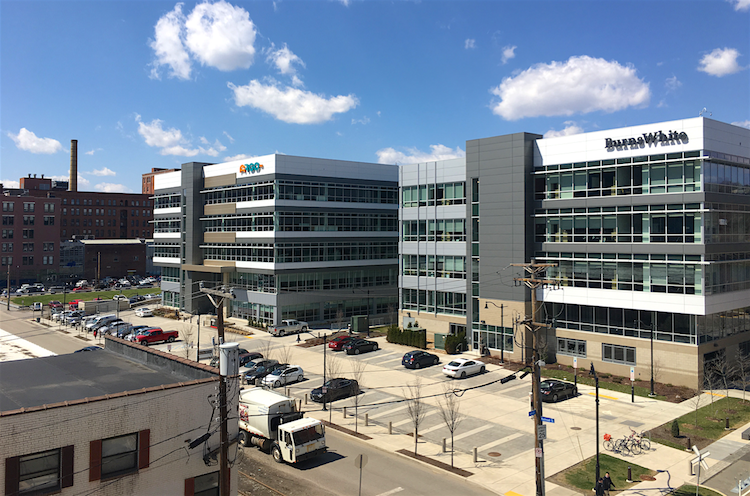 New office buildings along Smallman St. in the Strip now house tech companies such as Argo AI along with Serendipity Labs, a new co-working space. Photo by Jennifer Baron. While hundreds of apartments and townhomes are attracting new residents, there are growing concerns over the Strip’s larger infrastructure environment, such as safer access for pedestrians and bicyclists. “We were a business-central community in the past,” says Matthew Napper, president of Strip District Neighbors, a nonprofit neighborhood development group. Now, with the influx of new offices and companies, his group is asking new questions about access and quality of life. “We have to take more of a residential focus,” he says. Currently, the community organization is working with the city’s Department of Mobility and Infrastructure and other local stakeholders on a new multimodal transit plan to safely accommodate bike and foot traffic. And Riverlife continues to work with the city and corporate partners to make sure the newly available riverfront land is accessible to their neighborhood, and eventually the entire city, amid the building boom. Riverlife’s Design Review Committee meets regularly with the various property owners and developers working in the Strip, and Bontrager compliments the Edge 1909 building, the Burns White Center at 26th, and Oxford’s 3 Crossings development for investing in landscape improvements and public access to their riverfronts. At the policy level, Department of Mobility and Infrastructure Executive Director Karina Ricks told NEXTpittsburgh in February that a master plan for a complete, citywide trail and bicycle network is currently in progress. “Look for more meetings and a final report on that plan later this year,” says Ricks. Such connectivity is only going to become more critical as more new businesses and development projects move up the river toward Lawrenceville in the near future. This large tract of city property on Railroad Street fronts the river. The Mayor has said he’s willing to sell. Photo by TH Carlisle. On the entertainment side, there’s the newly opened bar and event space Kingfly Spirits in the 2600 block of Smallman St. and next door, a second location for Cinderlands Beer Co. is opening soon. And there’s plenty of construction coming, including Oxford Development’s Stacks at 3 Crossings project. Two buildings are under construction now, with completion expected in early 2020. Designs for a third office building, a public plaza and a parking garage are underway. 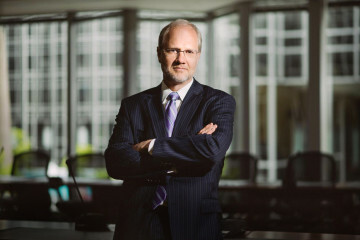 In an email to NEXTpittsburgh, Oxford Development President and CEO Steve Guy says the new project, among others, was a key factor in his company’s recent decision to move their own offices to the neighborhood, putting them in the same building as tenants like Argo AI and Serendipity Labs coworking space. But more than any single project or high-profile tenant, Napper says the success of the neighborhood will depend most of all on engagement and input from every stakeholder in the community, whether they’re startups, tech giants or long-standing family businesses.